What an amazing Throne Zone we experienced this year! People came with great anticipation, expecting God to Restore, Refresh and to Renew their spirit. God is so faithful, because that is exactly what happened. Every year following the conference, we are so blessed by the testimonies that come in. We weep and give thanks as people get down-right honest and truthful as to where they actually were in their lives, and what God did for them. Michele and I are always amazed at how God intervenes in each of these situations seemingly at the last possible moment. But thanks be to God that He is always on time. He is never early, and He is never late, contrary to what we may think. I know that Michele and I were able to minister from a different place in our lives because of the work the Lord did in us throughout 2010. We were at a place of burn-out and ready to throw in the towel. But thanks be to God that throughout the last half of 2010, God began to restore, refresh and renew many things in our life. And now we have more focus and less stress and a greater tenacity to dig the wells of worship and help people access their destiny through worship. For me, Friday night was a particular highlight. We enjoyed praise and celebration and Jumping into the River, yet in a quick moment we transitioned into the Throne Zone. I have not been to that place in the Spirit in a long time. It felt as if I needed a jacket or something to put over my head because the presence of the Lord was so thick in the ballroom. So many were prostrate upon the floor pouring out their all unto the Lord, and this was the night of many significant breakthroughs. I would like to share a few testimonies that have been emailed into us. “I knew that I had to be at the Throne Zone conference this year even if I had to be carried in. 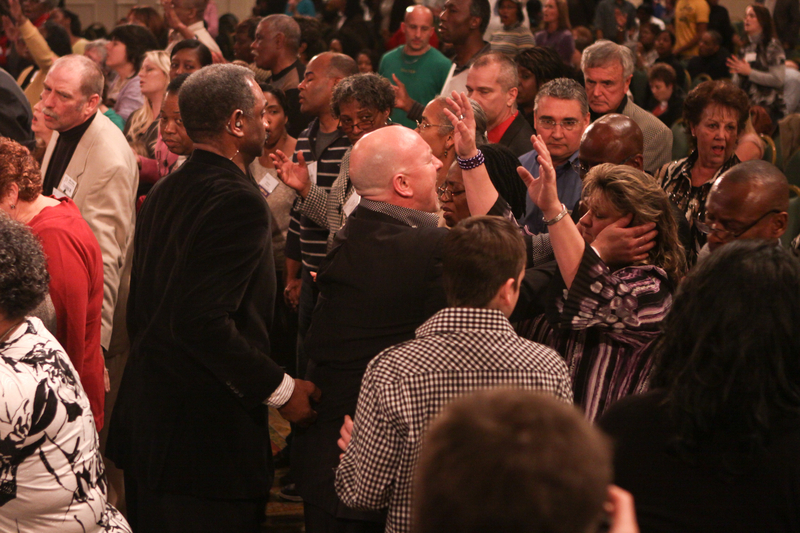 God had assured me that I would be healed during the conference. I told everyone that I was going to be healed and filled and I did not leave disappointed. This whole “test” began back in December of 2009. After having my gall bladder removed in surgery, the pain and vomiting continued. The doctors ran every kind of test on me to see what was going on and could never find anything wrong with me except a form of bacteria in my stomach lining that is very aggressive. They tried to treat this and nothing seemed to help me while I continued to loose weight. I had gotten to the point that I did not want to continue on seeing the doctors and not getting any results except a shrinking bank account from all the doctor and hospital bills. I knew that God was able to heal me and that He would see me through this. I stood firmly on His promise even though each day was a struggle. Because of your faithful and generous support, you are impacting lives like these represented above. Through your support, YOU are helping to ensure that purposes and destinies are not forfeited, but will be activated within the Kingdom! YOU are making sure that the well is deep and wide enough so those who are thirsty can drink and find refreshing in His presence. Scripture illustrates to us that anytime Jesus showed up, people were healed, delivered, set free or ministered to in a way that only God could minister to them. And we understand that these signs and wonders are the by-product of HIS presence. To that end, we continue to dig these wells of worship so that all who are thirsty will come and drink, find that refreshing in HIS presence, and be transformed by HIS glory! And from that, I believe they will begin to infect others with a pandemic outbreak of a fresh passion for the presence of God, resulting in souls being saved, healed, delivered and set free. To that end, we stand ready to dig these wells of worship while answering His Call, and we hope that you will continue to stand with us and see more testimonies like these come as a result of partnering with this ministry. We hope that you will mark your calendar for July 28-30, 2011 for our Throne Zone Charlotte. We will be making the final decision on venue within the next week and will announce the location for the conference. We are looking at the former PTL Television Studio complex here in Charlotte, with the intent on re-digging an ancient well that was here many years ago. I hope to announce the confirmed location the first of March, and confirm the theme of that conference. We will also provide a list of hotels in the area for you to select one that fits your budget. Additionally, we are hoping to begin our “Youth” track for the summer conference. This is very much upon our heart, and we believe that now is the time to move forward and raise up an army of worshipers in our youth and children. We love you and thank you again for partnering with us and helping us to answer HIS CALL! God bless you!